secure order form page at the Hearts & Minds website. More than a year ago, in November of 2015, a local UCC pastor and friend, Dr. Chris Rodkey, asked us for some Christmas-themed coloring books to offer during an adult Sunday school time during Advent. Hey, even out of the way places like Dallastown aren’t immune to national trends and the adult coloring book thing was, well, a thing. 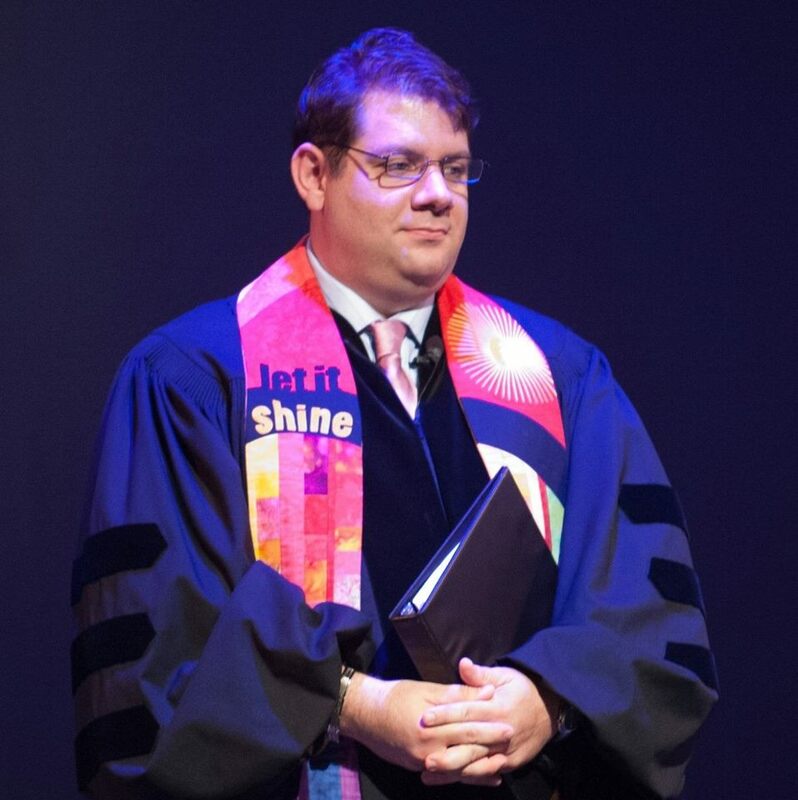 Pastor Chris Rodkey, though, isn’t a superficially trendy guy. He’s got a PhD in philosophy, drops the names of all kinds of ancient and postmodern scholars in conversation, has released two sermon collections bringing radical theologians and anti-empire themes into conversation with the Biblical text. He does like his pop culture so it didn’t surprise me to see a lovely quote about music by George Michael on his church sign-board when the British singer died. I’m sure he’s not the only preacher to have references to the Walking Dead in his sermons, but I suspect he’s the only one who did so with quotes from the likes of Rene Girard and the Pet Shop Boys. I know. So when this progressive voice for justice in our community – he made national news when a school board director from a near-by school district left threatening messages on the church voicemail because Chris had publicly wished our Muslim neighbors a happy Ramadan – wanted coloring books I was a little surprised. 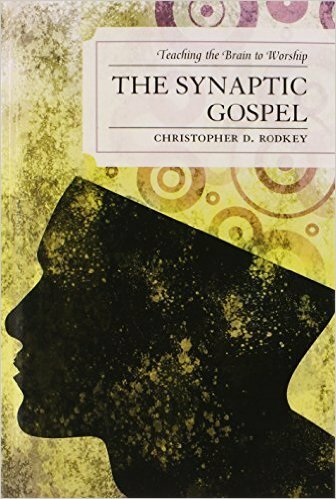 But here’s the thing: Rodkey is not only an attentive pastor, always on the look-out for ways to help his parishioners and church guests and seekers, he also wrote a book a few years back, cleverly entitled The Synaptic Gospel: Teaching the Brain to Worship (University Press of America; $26.99) which is a study of worship through the lens of neuroscience, a fascinating book offering some basic insights about brain studies and faith formation. I am sure it is not lost on him that there’s been a lot of research on this coloring book phenomenon. Apparently, there is something about the practice, the steady, careful, attentive work, the pace, the rhythm, the choices of color and hue that does something to the brain. Perhaps akin to yoga or deep breathing or tactile spiritual practices like using prayer beads or prayer walking, there’s this integral connection between body and soul. 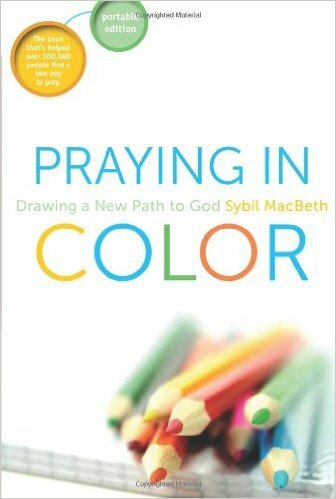 Not just a silly commercial flash in the pan, maybe there is something to this simple and creative practice; coloring books as prayer books. Picking up a Crayola or wooden pencil as spiritual gesture. I’ve rolled my eyes plenty about how Every Single Publisher is Getting In On This. And it concerns me that many of the best-selling religious books in the country right now are coloring books with vaguely inspirational titles. But, again, there seems to be some real benefit to using these and there actually are some that are pretty cool – I like an Aslan one we have, and there’s one done by a Roman Catholic liturgical artist where the Bible characters are reminiscent of medieval icons. Plenty are about quietude or words from the the Psalms, “Be Still and Know”-type verses to gently reflect upon as you color. 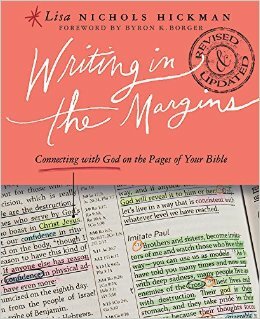 I suppose it isn’t quite the same thing, but maybe you recall my review a couple of years ago of the very useful book by Presbyterian pastor Lisa Nicole Hickman called Writing in the Margins: Connecting with God on the Pages of Your Bible (Abingdon; $16.99.) In that book, Hickman advises an interactive engagement with the Bible as we, literally, scribble on the pages of the Holy Book. True education bearing fruit of inner transformation takes more than what we used to call “book learning.” James K.A. Smith has been saying that in his heady pair of Baker Academic books Desiring the Kingdom and Imagining the Kingdom and in the accessible , must-read Hearts & Minds Best Book of 2016, You Are What You Love: The Spiritual Power of Habit (Brazos Press; $19.99.) Participating in rituals and experiences and whole-body engagement is part of how we embodied humans learn, truly. As blue-collar work-world cultural critic Matthew Crawford says in The World Beyond Your Head: On Becoming an Individual in an Age of Distraction the stuff we do does stuff to us. Which brings me back to Chris Rodkey, the brain studies/social justice worker/progressive pastor who wanted those simple coloring books for Advent. In a season of Christmas consumerism and holiday hectic-ness and all manner of anxieties and stress that does stuff to us, his church folk loved the opportunity to play a bit, to get in touch with something fun, seemingly child-like, and it brought up adult-size conversations about quiet and peace and joy and rest and gospel. 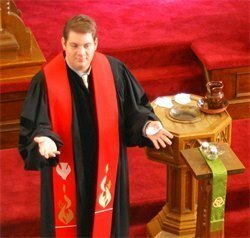 This quasi-liturgical practice opened up space for God and, given that they’ve heard Chris’s radical sermons (the kinds found in his two books of sermons, Too Good to Be True: Radical Christian Preaching,Year A and The World Is Crucifixion) a realization might have cropped up among them. This stuff is subversive, its own little Advent conspiracy of resistance. And so, Chris got to work. He found an accomplished illustrator, called some folks at Chalice Press, and as quick as one can say Magenta or Periwinkle they had a plan. He would create two coloring books with thoughtfully meditative reflections on the Biblical texts for the lectionary, one for this coming Lent, another for next Advent. Chalice Press has been very excited, and we are too. 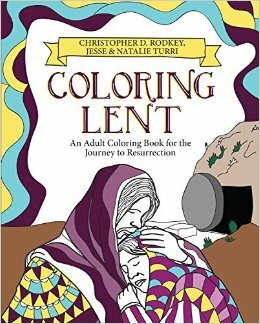 Coloring Lent: An Adult Coloring Book for the Journey to Resurrection by Christopher D. Rodkey & Jesse & Natalie Turri (Chalice Press; $12.99) just arrived and I’m tickled pink. As you color these pages, then, consider how your fingertips, your palms, your body have now become the habitat of God, and following the stories of Hebrew and New Testaments, consider how we might also walk the same journey as Jesus. He gets the embodied nature of Christian formation. And this guidebook can be a way into it. At least three things sets Coloring Lent apart from the zillions of others of adult coloring books, even the many, many religious ones. First, this is the only adult coloring book that we know of that is geared to the Biblical texts of the Revised Common Lectionary. What a brilliant idea! Of course if you do not use the assigned lectionary texts these are still mostly well-known Biblical passages, the second half almost exclusively drawn from the last weeks of Jesus’ life. If you are a typical mainline Protestant, Roman Catholic or Orthodox believer, these Year A texts will be used in your own worship this season. But occasionally Dr. R throws in a rumination that is well worth pondering critically. What is implied in his Ash Wednesday piece about kenosis as “exhaustion”? (See the footnote on that one, for sure!) What does he mean when he says that Jesus “died as much from doubt as asphyxiation” in the entry for Lent Day 41 entitled “Into Your Hands”? How comfortable will you be with his “Death of God” language throughout Holy Week? I suspect if one enters into this quiet practice of prayerfully approaching these meditations there will also be some distress: Cain’s violence is depicted when the Lectionary reading is from Genesis 4 and Ephesians 2 – his take on being “children of wrath.” It may at first seem cool, but I my heart was heavy as I pondered his page of Jesus overturning tables and cleansing the Temple. How does one enter into the story of Peter cutting off the ear of a soldier in the garden? And wait until you see the stunning skeletons coming out of the grave in the page called “The Resurrection of Bodies” with art created by Natalie and Jesse Turri from Matthew 27 for Holy and Great Wednesday. In fact, I think there is so much substance in these short reflections — and endnotes! There are endnotes and an index, in a coloring book! — that I am going to use this as a daily devotional myself, even if I don’t use it as a coloring book. Most of the black and white drawings are so interesting that they stand alone as enhancing illustration. (I’m still pondering the Celtic cross image, designed from the curved body of a snake, to illustrate the Nuhustan of Numbers 21 – brilliant!) Sure, these drawings are awaiting you to pick up your colored pencils or pens to experience the process of engaging them, and the texts they illuminate, but even if you’re not the coloring type, reading this in itself is a provocative bit of midrash. Further, not only is there interesting, generative reflections for each page of art and Biblical text, the art in Coloring Lent itself has moments of brilliance. As Rodkey explains in the dense and beautiful introduction (the only coloring book I know of that has an almost scholarly introduction, citing Malcolm X and Thomas Altizer and Catherine Keller) there are, especially in certain streams of Christian tradition (the Orthodox?) intentional reflection on the image and metaphor of clouds. There is the famous glory cloud in the Hebrew Scriptures, and there are numerous references to the cloudy glory of God – one of the lectionary readings is from the famous Ichabod story, another in the “cloud of darkness” what covers the earth as Jesus cries out in dereliction “Eli, eli, lema sabachthani?” How will you experience this text, ponder this picture, engage it with pencil or pen? For what it is worth, I might note this, too: there’s artful detail, here, and a few entries are quite a bit more interesting than others; this isn’t silly. However, they were attentive to the use of these, knowing that this is to be a spiritual practice that is helpful. These aren’t over done or tedious like some 1000-piece jigsaw puzzle. Rev. Rodkey’s use of theopoetics and The Cloud as a stand-in for the name of God is constant and the cloud images in the pictures are everywhere throughout Coloring Lent. I can’t help but wonder if it is both his progressive sense of being denominationally ecumenical and his former background as a Pentecostal that has given him eyes to see this stuff. The artists certainly are aware of much, too, working well with Rodkey’s vision (or was he riffing off theirs?) Other ecumenical images certainly make their way into the artwork – the one from Day 36 links the unpleasant and despised image of Jesus in the Lectionary reading from Isaiah 53 to the story of Veronica and her veil. There is a beautifully written and illustrated epigraph page – a prayer inspired by St. Ephrem the Syrian – for “Clean Monday” (a day the Orthodox use to prepare for Lent by, in some traditions, flying kites, a custom somehow related, Chris suggests, to our central Pennsylvania Dutch Fastnacht Day habit of eating donuts almost like the Catholics feast in New Orleans on Shrove Tuesday.) Who does stuff like this in the intro to a coloring book? Besides Ephrem the Syrian showing up, we get literary and theological nods to the broader body of Christ – calling Psalm 91 by its Latin, Qui Habitat, for instance, or the book’s Benediction from a “Chrism Mass” (the Maundy Thursday observation performed by Roman Catholic Bishops to bless the anointing oils which will be used the coming year. There is an extensive index to help you use the book in various ways and settings, for instance, a guide to using certain pages to accompany you on John Paul II’s Stations of the Cross. And there are plenty of ecumenical visual cues – perhaps you will see hints of Botticelli, and certainly one which seems iconic of Jesus the Pantocrator. And gladly, some quirky radical theology stuff and footnotes to Zizek notwithstanding, there are remarkably generative Biblical insights here, good solid stuff. The ongoing visual of snakes – crushed by Christ, finally! – is simply solid historical-redemptive stuff connecting scenes from the ancient Hebrews to the New Testament, offering resonance in ways that guys like Richard Hays or N.T. Wright would call “echoes” of Scripture, finding the Old in the New and the New in the Old. Perhaps the artists had radical Orthodox icons in mind and not Edmund Clowney, but the inter-textual allusions are fabulous. The prayer for the Easter Vigil is from Proverbs 8, Song of Songs 4 and Baruch 3. His paraphrased prayer from Hebrews 9 and 10 — “A Prayer to Enter a New Temple” — includes simple swirling art but the words are shattering: “May we in like manner encourage each other in our shared task of preparing our hearts to be liberated sepulchers of the Divine, which pours out perpetually as love for one another and especially the poor and hopeless.” Spend some time being intentional in focusing on that line or two, get out your Bible and look up the texts for yourself, and, crayons or no, allow this kind of goading to guide you to Jesus. 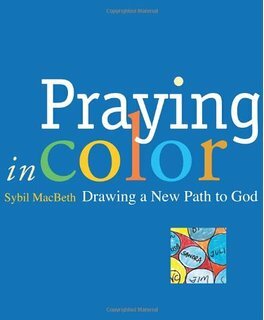 …engage both your heart and mind as you color and pray your way through dozens of evocative illustration and meditations from God’s resurrection story. As you color and contemplate each image, you’ll be drawn deeper into the story and your place in it.